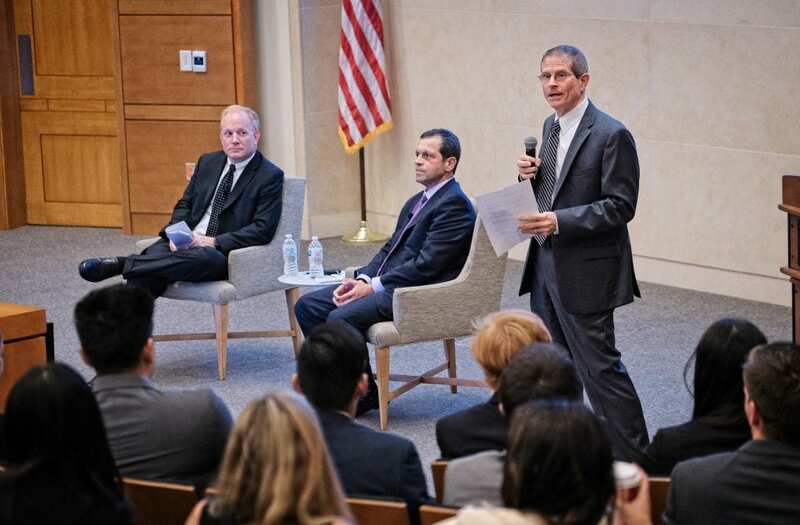 Modesti (P ’20) and Josh Jones (BS ’95), an EY partner and former fellow of the Securities and Exchange Commission, gave the 2018 Hylton Lecture November 8 in Broyhill Auditorium. The pair regularly interacted when Jones was with the SEC, during Modesti’s 14 years at the PCAOB. At the PCAOB, Modesti led a team of attorneys, accountants, and other staff which investigated possible violations of rules and securities regulations, taking legal action when necessary. He explained that advancements in technology, data collection, and analytics are rapidly disrupting the broader financial reporting system. That’s one reason why the PCAOB established the data and technology task force to gain insights about the use of new technology in audits. Technology allows companies to be more efficient and gain more insights. Organizations are turning to auditors to make their process more efficient as well. “Does the risk of fraud increase with new technologies?” Modesti asked. “Most regulators are under-resourced. It’s important to use and assess data while protecting the public interest. While artificial intelligence has been mentioned as affecting the accounting industry adversely, Modesti shared information from the U.S. Bureau of Labor Statistics. According to the Occupational Outlook Handbook, the number of accountants and auditors employed in the U.S. is expected to grow by 11 percent from 2014-24, faster than the average from all other occupations.